I'm squeaking in at the last minute -- or almost the last minute. 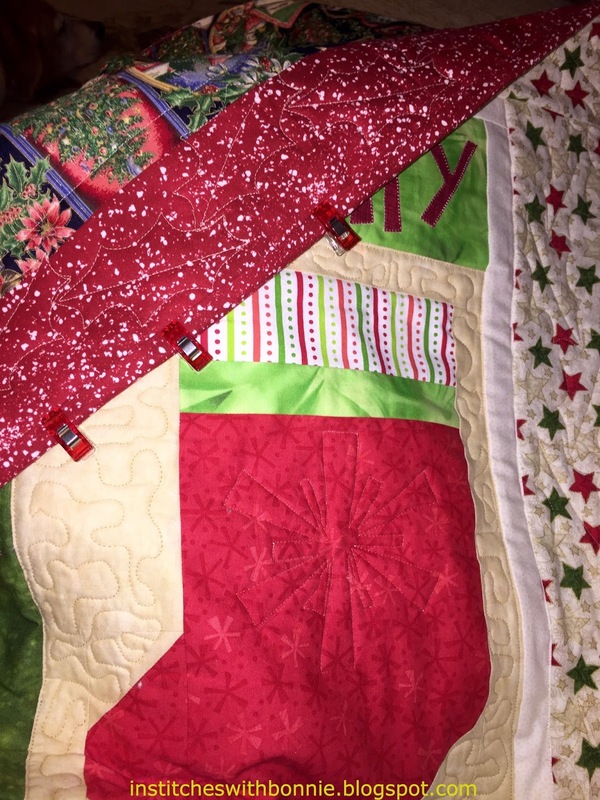 I'm hand stitching the binding down on Christmas Favorites -- should be done long before midnight tonight. I'll still have some threads to tie off -- I did several different background stitching including a diagonal stitching that had a million starts and stops and every one has to be tied off. I'll be working on that tomorrow. For the most part it is done. Well, except about 30 buttons that need to be hand sewn on -- but I'm still saying it is done! I'll share pictures later when I can get some decent ones. It's suppose to be cloudy and/or rainy for the next few days. I'm linking up with One Monthly Goal at Elm Street Quilts. I've got a few days to figure out what my next OMG will be. It probably should be to finish one of my Taps quilts. Only a couple of rows need to be sewn together and then it needs quilting. I'll let you know in a few days. Congrats on meeting your OMG! Looking forward to seeing the finished quilt. Well done! Can't wait to see it with all the embellishments.